The short poems in this first fully fledged collection by Andrew Lansdown may be read singly or as a sequence that covers the whole of the poet’s life, from memories of childhood through to marriage and the birth of his first child. Poems celebrate a wife and grandparents, animals and birds, the loneliness of the human spirit as well as its communion and identification with others. Always alert to the shapes and textures of the natural world, some of these poems have the frail beauty of oriental art, while others are urgent with social criticism and indignation. They introduce to a wider public a young poet who deserves to be better known outside his native Western Australia. only to keep my small son from crying. I carry him down to the river. A slight mist lingers by the bend. Trees stand on their heads in the still water. Has he seen a river before? to make sure I have seen it. How can anyone find anything so amazing? fill him continually with joy and wonder. This is what death has done. For whom did we make this wreath? He is blind and dumb. Yet each alone in our grief. Made him blind and dumb! To the circle of his sight? To the Father of Light? two swallows have come to make a home. and weave through the air. where they come to rest. of the West Academic Wing? here is an opulence I had forgotten. driven before the tempest of their happiness. in the shade of trees and in each other’s company. have never been open to doubt. light their lanterns and lay out their nets. and toil together in the hope of harvest. how weighted down on one side of the scale. in their own ways dark and hard. to lighten and soften the heart. in their own way dark and hard. Lansdown is a young West Australian poet who is emerging as one of the distinctive voices of Australian poetry. This ample volume reveals him as a maker of gentle, celebratory poetry characterised by an acute sensitivity to the wonder of life, and a perception of “the mould, the snub/ of God’s thumb” pressed into creation. Counterpoise—the balancing of two contrary realities—lies at the heart of Lansdown’s achievement. It describes both the content and the approach of the poems. Stylistically, Lansdown leans towards a simplicity of observation and technique which—in counterpoise—often produces poignant insight. His expression is clear and precise, but never mechanical; it operates to clearly convey to the reader the content of the poet’s perceptions and feelings, yet seldom boxes us in to prevent the flight of our thoughts and feelings beyond the poem. Again, a counterpoise. They own the river from here to the sea. at the merest thought of them. So much dying to be done! Of your breasts and hear you breathe. Just hold me and let me grieve. for the joy and grief of your growing. Faith in God for the poet is affected deeply by this interfusion of life and death. So powerful is death that even the overwhelming promise of the resurrection and the triumph of good over evil is clouded by its shadow (“Behind the Veil”). Yet the promise is sure—not arrogant with a facile certainty but resting in the stillpoint that God is, in a world that tosses its creatures between the poles of life and death without apology. God peeps through Lansdown’s poetry rather than overwhelms it. He is “The old Japanese gardener/who keeps the river”, the creator who leaves His thumb-print in His work, the One on the other side of death. And like that “familiar strangeness” that grips the heart (“Sehnsucht”) or the faint strumming of a guitar “as if a bird in a cage/had swept the bar with its wings” (“Behind the Song”), His presence in the poetry tips it with joy. Andrew Lansdown is a West Australian who over the last few years has built up a reputation as one of the State’s most gifted and versatile younger writers. Counterpoise is his third book, and the first major collection of his adult poetry. Although the poems cover a wide range of themes and employ a variety of techniques, a notable quality of many of them is their ability to capture small, sharp images. Although these image poems seem at first very simple, the simplicity is often deceptive, leading on reflection to considerable insights about the richness and wonder of nature, the world and spiritual relationships. and hold a tree in my hand. “I Whistle and They Come” is a longer and more complex poem, inspired by an illustration of a Chinese child calling ducks. It is a fine example of Lansdown’s ability to put small things into larger relationships. As the child has conditioned the ducks, so the child itself is being conditioned (and perhaps like them will eventually be devoured). and killed the bantam hens. We heard nothing but the rain. smothered squawk and bark and din. During the night the dogs came. during the night, the dogs came? We hear nothing but the rain. yet we heard nothing but the rain? 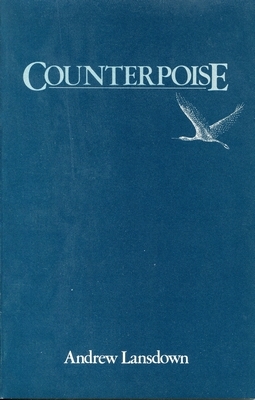 Counterpoise is a book I would recommend for a number of reasons: it should be enjoyed by all admirers of good poetry and of the courageous expression of values, and it is also one of a number of books which could be read with profit by many hopeful and budding practitioners of the art. One quibble I have (which is not the author’s fault) is that like many books of poetry Counterpoise suffers from an uninteresting cover. Readers should not allow themselves to be put off by this.